Let’s End This Debate Right Now – To Warm or Not to Warm? This time of year always brings about the same age-old debate on the necessity to warm up a vehicle before driving or to forego it entirely. True to form, this year has seen many articles claiming the requirement of warming an engine to be invalid. Sadly, this misinformation has been disseminated to countless individuals via the internet and has, in turn, caused countless vehicles to become inoperable due to engine wear caused by immediate driving after cold starts. 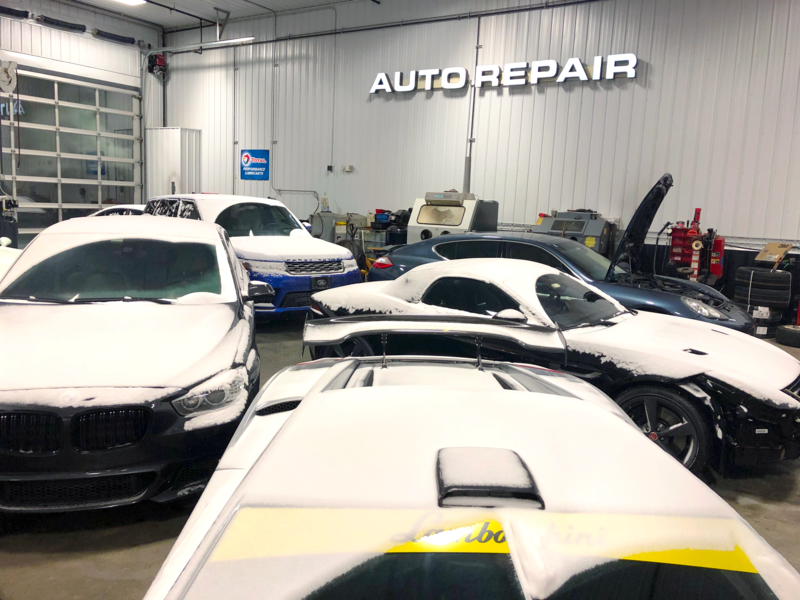 Fluid MotorUnion has been on the repair end of this spectrum for over 10 years which has afforded us the opportunity to see the damage that comes from cold weather starts. We can confidently recommend that your car absolutely must be warmed before being driven if you want to make sure your vehicle stays on the road for years to come. The misconception stems from the fact that modern cars are no longer carburated. A carburetor was a mechanical method of delivering fuel, that was very difficult to calibrate properly for sub-zero weather. Modern fuel injection has replaced carburetors and direct injection has become the most commonly used method, by manufacturers, to deliver fuel. Articles claiming you don’t have to warm your vehicle cite engineers who claim the precision of fuel injection can compensate for extreme temperatures, thus warming up is a waste of gas and adds pollutants to the atmosphere. From an engineering standpoint, this is true. However, people seem to think that an engineer’s viewpoint is the final and most valid word. No matter how you cut it, no engine manufacturer designs a component to last forever. Controlling costs, technological limitations, design oversights and even planned obsolescence are some of the problems designers have to deal with when producing an engine. The cold puts incredible strain on many vehicle components, but the engine is most definitely the hardest hit. The low temperatures can cause hoses, gaskets, and tanks to contract, making them brittle and less likely to seal. Bad seals manifest as leaks which often lead to low fluid levels, damaging vital components. However, the most potentially catastrophic issue aggravated by cold weather relates to oil supply. In cold weather, the viscosity of oil increases, meaning your oil pump has to work harder to supply lubrication to the necessary mechanical components. This increased difficulty moving highly viscous oil means during the time it takes to get oil to the necessary components, increased friction occurs. On an extremely cold day, it’s essentially trying to pump oil akin to molasses until everything warms up. This added strain puts wear on all rotating components. The stress not only comes from the increased friction but also the added strain of rotating the mass of the engine against the slower moving oil. This added resistance can stretch timing chains or belts. Many modern engines are lined with aluminum for increased resistance to friction. Unfortunately, even with this special Alusil coating, a major problem can arise: galling. Galling is defined as a form of wear caused by adhesion between sliding surfaces. With an iron block or steel lined engine, wear or increased friction will sheer pieces abruptly off, causing scoring or scratches. However due to the “softer” nature of aluminum, it is more likely to deform instead of sheer, and that bunches the material together, which in turn drags more materials with it. The end result is a snowball effect of catastrophic engine failure. Because manufacturing and applying Alusil is a complex industrialized process, recoating damaged liners is difficult. Only a few specialized rebuilders exist that have cost-effective methods for replacing damaged cylinders. This means that if the engine is damaged, the cost to have it fixed will likely exceed the cost to replace it with a known “good” used engine. This is unfortunate, as many older vehicles will likely be scrapped due to the excessive cost of repair vs the current value of the vehicle. Due to stricter emission regulations and increased complexity of the crankcase breather systems, moisture can wreak havoc on the vent valves and oil separators. Moisture created in the first minute after startup can take a minimum of 12 minutes of highway driving or 30 minutes of running time. And in cold weather, this moisture can freeze shut your engine venting system, causing catastrophic damage that can leave you stranded out in the cold. This means that at some point chances are you may be the owner of a vehicle that experiences an engine failure. Especially if you live in a climate that experiences extreme cold, the odds are even greater that you will have a few Cold Weather Car Problems. So why is all this important? LET YOUR CAR WARM UP! A good rule of thumb is to let the coolant temperature needle lift off to whatever the next temperature indicator is just above dead-cold before driving away. This goes a long way in protecting your engine if you want to keep your vehicle running for years to come. As you can probably imagine after reading this far, you would need to run your engine for at least 30 min to remove the moisture you just created. This also gives you time for your battery to recharge, as a start in the cold weather is the most demanding thing you can ask of your vehicle. So making sure you have a good battery and investing in battery tender will keep the battery healthy and fully charged. If you feel you may already be victim to cold weather issues with your vehicle, please reach out to us to find out more about how we can help prevent further damage to your engine before you need a replacement. Call us today to set up an appointment (630) 305-3054 or email info@fluidmotorunion.com!